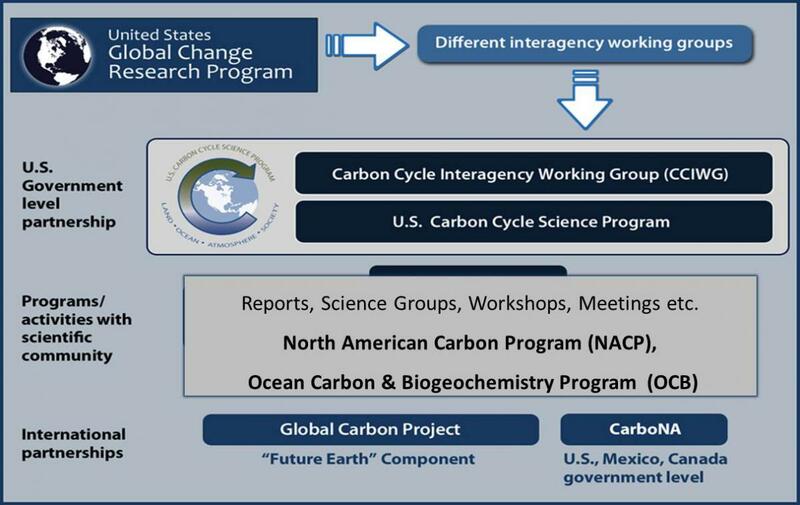 The Carbon Cycle Interagency Working Group (CCIWG), established under the U.S. Global Change Research Program (USGCRP), formerly known as the U.S. Climate Change Science Program, has full authority for all Carbon Cycle Science Program policy and activities in the United States. The CCIWG, whose members represent 12 federal agencies, coordinates the development and execution of each member's individual and interagency federal research program in carbon cycle research. Leadership of the CCIWG comes from senior-level managers of the participating agencies and ensures the success and continuity of the program. Involve the scientific community with the purpose of providing the needed science to understand the carbon cycle. The CCIWG coordinates and integrates the carbon cycle research funded by the U.S. government. The CCIWG plans, evaluates and reports on interagency coordination and implementation of carbon cycle research of participating U.S. agencies. See the 2015 CCIWG Terms of Reference (updated in November 2015) for more details. The goals and objectives of the carbon cycle research coordinated by the CCIWG align directly with the goals of the USGCRP Strategic Plan and are being implemented in harmony with the USGCRP Implementation Plan. The specific carbon cycle goals will be guided by the USGCRP Strategic Plans and community based science plans (e.g., the 2011 community-based science plan: “A U.S. Carbon Cycle Science Plan). CCIWG activities and functions also support new priorities and directives of the USGCRP, as well as carbon cycle research needs arising from new scientific findings and observations. CCIWG activities include, but are not limited to, meeting regularly to exchange agency information, implementing the Strategic Plan of the US Global Change Research Program, and revisiting the U.S. Carbon Cycle Science priorities as needed. In addition, the group represents agencies at program meetings, interfaces with the scientific community, initiates workshops, and links to international programs and organizations. The CCIWG members officially meet as a group on a tri-weekly basis in Washington, D.C. The group also meets twice a year with the Carbon Cycle Scientific Steering Group (CCSSG) and the NACP SSG and regularly interfaces with the OCB. Organized by the U.S. Carbon Cycle Science Program Office and NACP Program Office (in case of the NACP SSG), these formal discussions facilitate the CCIWG's mission in achieving its following objectives based on the 'The National Global Change Research Plan 2012-2021', '2011 Carbon Science Plan', emerging US Government Priorities, evolving science and resultant needs of the scientific community. The CCIWG is responsible for the development of research plans for U.S. carbon cycle science (land, ocean, atmosphere, and human dimension). Detailed implementation plans will be developed through CCIWG-sponsorship of planning efforts involving the carbon scientific community and/or the Interagency Subcommittee on Global Change Research (SGCR)*, as appropriate. The CCIWG plans, strategizes, and coordinates agency and department approaches for addressing carbon cycle research priorities and needs by developing single- and multi-agency solicitations that will increase the overall value of the research. CCIWG maintains interagency awareness by exchange of agency annual plans and coordinates allocation of resources to the extent possible. CCIWG seeks to reduce redundant research, review and paperwork through this coordination. CCIWG identifies implementation priorities annually with formal recommendation of carbon cycle research priorities as requested by SGCR. The CCIWG assesses the extent to which carbon cycle goals and objectives of the 2012 USGCRP Strategic Plan are being met by Federally-funded researchers. The CCIWG takes steps to ensure that this research remains relevant and productive and provides feedback to the SGCR on progress and priorities. The CCIWG provides contributions to USGCRP’s annual report (Our Changing Planet). The CCIWG provides input to or sponsors the development of other USGCRP documents (e.g., Strategic Plan, National Climate Assessments, etc.) and reports on research plans and results, as requested and/or appropriate. CCIWG interacts with and supports USGCRP and its subsidiary IWG's, other related government programs, and segments of the scientific community and public. The goal of these interactions is to guide the Nation's carbon cycle research in ways that improve our understanding and prediction of coupled Earth (natural and human) systems in the context of a changing climate, and that serve governmental and societal needs. The CCIWG facilitates relevant synthesis and assessment processes by coordinating interagency inputs, reviewing draft prospectuses and reports, and providing agency feedback to lead agency and authors. The USGCRP's National Climate Assessment (NCA) and the State of Carbon Cycle Science Report (SOCCR) are examples. The CCIWG serves as a point of contact between the SGCR (including its USGCRP Director), the National Coordination Office, other USGCRP IWGs or subcommittees, other relevant agency programs, the research community of carbon cycle science, and the general public. It also supports and coordinates with appropriate international programs such as Earth System Science Partnership (ESSP), the Global Carbon Project (GCP), the Global Atmospheric Watch Programme (GAW) of the World Meteorological Organization, and Group on Earth Observations (GEO) Carbon, the carbon component of the Global Earth Observing Systems of Systems (GEOSS). In addition, the U.S. Carbon Cycle Science Program Office serves as an Affiliate Project Office of Future Earth's Global Carbon Project. The CCIWG focuses on interagency research and funding themes based on recent scientific advances and needs such as those highlighted in the 2011 Carbon Science Plan, the USGCRP goals (2012-2022) and individual agency focii. Examples of such CCIWG priorities are reflected in the recent NASA-Research Opportunities in Science of Earth and Space (ROSES) Carbon Cycle Science Solicitations (2013, 2016), produced in collaboration with CCIWG members. Research proposals to improve the understanding of changes in the distribution and cycling of carbon among the active land, ocean, and atmospheric reservoirs and how that understanding can be used to establish a scientific foundation for societal responses to global environmental change were sought in alignment with the research agenda of the USGCRP, and, specifically, its U.S. Carbon Cycle Science Program, as well as the goals and objectives of the individual CCIWG agencies participating in this joint solicitation which can be accessed via this link. * The Interagency Subcommittee on Global Change Research (SGCR) coordinates the implementation of the USGCRP, in cooperation with the Office of Science and Technology Policy (OSTP). US Global Change Research Program. 2012. The National Global Change Research Plan 2012-2021: A Strategic Plan for the US Global Change Research Program. A U.S. Carbon Cycle Science Plan. 2011. A Report of the Carbon Cycle Science Steering Group and Subcommittee, Anna Michalak, Rob Jackson, Gregg Marland, Chris Sabine, Co-Chairs.